A complete listing of free web-publications and web-comics, by J. M. DeSantis, which have been published over the years, for your enjoyment. 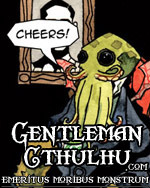 Gentleman Cthulhu is a humourous horror web-comic by J. M. DeSantis. It is published weekly in the traditional three-panel format. Book of Lies is an on-line web-comic anthology with stories written by Paul A. Newman and illustrated by various artists. J. M. has lent his talents to the Prologue of the web-comic (a prose story). Loosely inspired by urban legends of his native New Jersey, this two page web-comic is juxtaposed to J. M. DeSantis’s poem of the same name. This is a very early work of J. M. DeSantis’s. It is also the first publication of his writing. The story of a man and his son as they shelter themselves in their home during a zombie epidemic. The Vigil is a two page, full colour, horror comic, written by Scott Sheaffer and illustrated by J. M. DeSantis. This is a very early work of J. M. DeSantis. It is also one of the rare few digitally coloured works of his. *Note: DrunkDuck.com has a habit of changing their urls without notice (it has happened at least twice since these comics were published). If you find the link is not working, please let us know through the contact page. J. M. DeSantis’s first graphic novel, Chadhiyana: In the Company of Shadows, began as a web-comic. In 2015 it was picked up by Rosarium Publishing for digital release. The first 24 pages of the original run (72 pages) is still on the site as a free preview of the graphic novel. Synopsis: The shadowy Tal-Ifatiir are on a quest to destroy the demon lord, Aghal-Paraag. As they journey toward his fortress with his imprisoned servant, a powerful witch, one misfortune after another befalls them. And Chadhiyana, the first female member of the order, seems troubled that their prisoner is a woman. Now defunct, the site once contained a full listing of the comics J. M. DeSantis created for Game-Flush.com, under the moniker The Corporate Ninja. It featured various humourous short comics both of recognisable video game characters and members of the Game-Flush Staff. Some consideration has been given to re-posting these comics here on jmdesantis.com.